Jackson Creek Preserve is a 34 acre wetland located along Jackson Creek, just east of Highway 67 south of Elkhorn. The property was donated by Mel and Connie Helms to the Land Trust of Walworth County in 2003. In 2009, this land trust merged into Kettle Moraine Land Trust who has since been managing the property for plant and animal diversity. Historically, the Jackson Creek watershed was once dominated by oak savanna and large expanses of wetlands and prairies. Europeans began to settle in the area in the mid 1800s, primarily within the City of Elkhorn area. Because the soils adjacent to Jackson Creek are so productive, farming developed quickly, which led to clearing of forests and natural areas and draining of wetlands. The loss of native ecosystems, and stream channelization in the Jackson Creek watershed has negatively impacted the water quality and wildlife in this system. This preserve is considered one of the healthiest wetlands in the watershed. 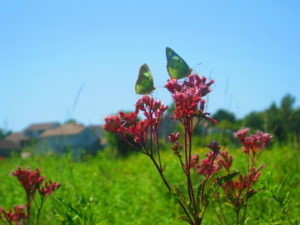 Jackson Creek Preserve contains both native sedge meadow and fen species, and provides refuge for birds, amphibians, reptiles and a multitude of moth, butterfly and other pollinator and insect species. The Preserve is periodically burned to stimulate the reproduction of native grasses and wildflowers. Invading exotic species are removed as needed, and the creek is monitored by the Wisconsin DNR for fish and aquatic species diversity. Since the preserve is predominately wetland, there are no trails or other amenities.